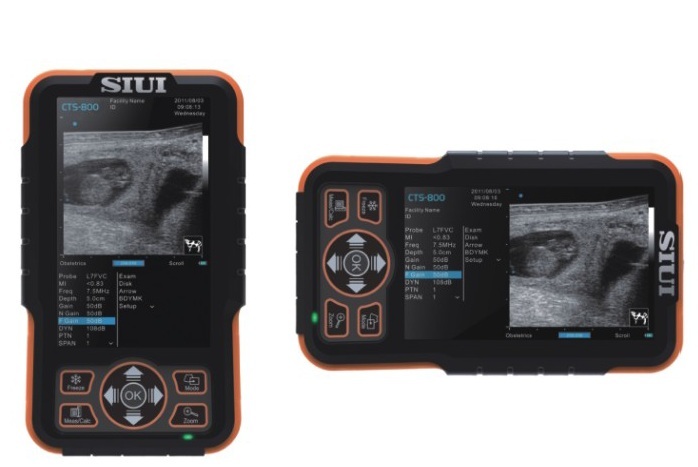 The SIUI CTS-800 is a palm sized ultrasound designed for "out in the field" use. It's design is compact and is easy to operate. The unit is waterproof and has a gravity sensor for layout change when unit is turned on it's side. 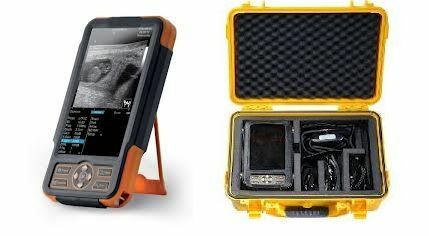 Can be used for various applications including livestock pregnancy detection. The grid on the image area helps to easily estimate the size of the target substance like follicle fertilized egg, etc. Environmental Rating: Ip64(main unit, Ip67(probe head). Battery: 2.5-3 Hours of Operating Time. Display Mode: B, 2B ZOOMB, B/M, M.
Image Layout: Gravity Sensor changes from Vertical to Transverse. Measurement: Distance, area, circumference, volume, angle, heart rate. Software Report: Backfat, eyerib area, rump fat and reproductive. 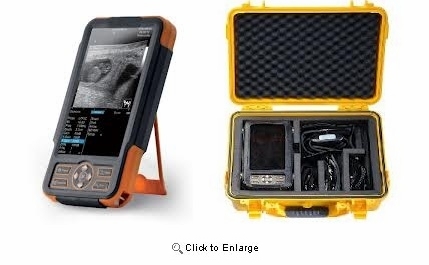 Includes: Portable Unit with rechargeable battery, Power Supply adapter, charger, L5FVC-Linear-Rectal-64mm probe, power cable, cigarette lighter cable, USB cable, BNC/RCA cable, hand strap, sunshade, bag, operation manual and carrying case. Other probes available at an additional cost. Unit has a 2 year limited warranty from manufacturer.